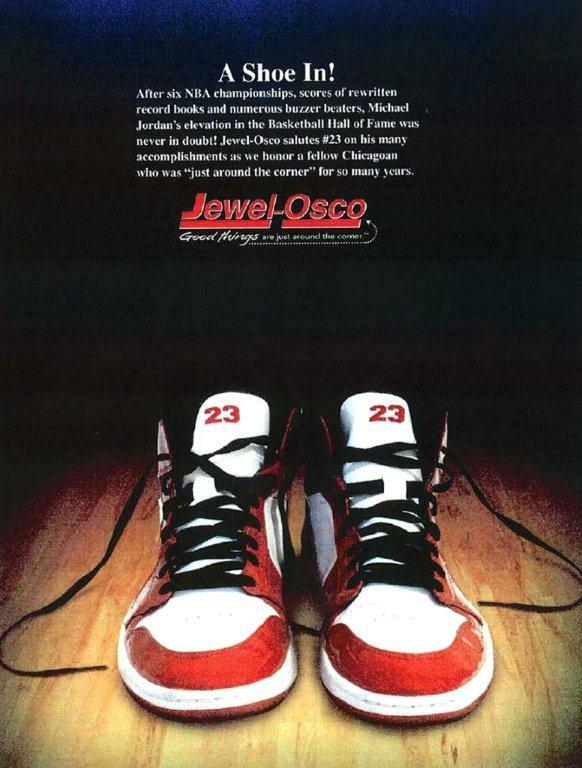 When Michael Jordan sued Jewel Food Stores, purveyors of the Jewel-Osco supermarkets, for running a full page ad in Sports Illustrated (see above) congratulating the retired basketball superstar on his induction into the Hall of Fame, reactions from Chicagoans ranged from bewilderment to outright resentment. What could arguably the greatest sports icon of the modern era possibly gain by trying to squeeze a few extra bucks (by MJ’s standards) from a local supermarket chain that just wanted to celebrate his achievement? The ad, after all, wasn’t really an ad, so much as a printed tribute to a basketball legend. It was a symbolic gesture of local pride and support; not a shallow attempt at promoting a half-off sale on paper towels, Jewel maintained. Well, Jordan and his lawyers disagreed. They argued that an ad is an ad. And whatever its purported intent, this ad misappropriated Michael’s valuable publicity rights, which Jewel used to its commercial advantage. The initial public backlash against Jordan when the suit was first filed back in 2009 seemed justified when the district court in Illinois dismissed the complaint on the grounds that Jewel was simply excercising its constitutionally guaranteed First Amendment right to offer congratulations to a sports icon. However, last week, Jordan was vindicated; perhaps not in the eyes of his Chicago fan base, but at least according to the United States Court of Appeals for the Seventh Circuit. That court vacated the lower court’s ruling and remanded the case with instructions that the Jewel ad was, as a matter of law, a commercial message. This is a crucial blow to Jewel’s First Amendment defense, because commercial messages are entitled to significantly less First Amendment protection than non-commerical messages. And that was the Jordan camp’s position all along; that this was a Jewel-Osco brand ad masquerading as a show of support for a local celebrity, and that the company’s true intent wasn’t to honor his accomplishments but to build brand equity among Jordan’s legions of Chicagoland fans. Setting aside for a moment the wisdom of Jordan’s suit, the case raises a question that’s becoming more and more relevant for advertisers in an age when ads are trying their hardest not to look like ads: where is the line between commercial and non-commerical speech? It’s a good question, and the truth is the line is getting very blurry, but for the last 35 years the starting point for delineating it has been to ask: does the speech propose a commercial transaction? In this case the answer to that question is of course no, and that’s the answer that the lower court focused on when deciding to rule in the Jewel’s favor. It’s also been established, however, that the commercial transaction question is merely the beginning of the inquiry. Not the end. That’s because it’s a question that has become less and less relevant in a world where the definition of what constitutes a commercial proposal, not to mention a commercial transaction, has become incredibly muddled. Therefore, case law further instructs courts to ask three additional questions: is the messaging delivered via a medium that’s typically used to deliver a sales message? Does the messaging refer to a particular product or service by name? And is the primary motivation behind the messaging economic gain? Looking at the Jewel ad through this finer lense tends to lead to affirmative answers for all three, and these are the answers the court of appeals rightly focused on in overturning the lower court’s dismissal. Indeed, one of the things the court of appeals pointed to in support of its decision was the presence of the Jewel-Osco logo smack dab in the center of the ad. So what does this mean? While all of this legal deconstruction may make for good blog fodder, advertisers don’t have time to pore over court opinions or try and decipher esoteric legal tests before taking their messages to market. So the simplest and perhaps most practical way to figure out if any given communication is commercial (and therefore subject to higher scrutiny and more stringent regulation) is to view it in the context of the who and the why? Who is communicating the message, and why are they doing it? Had the Chicago Chamber of Commerce, the Boys and Girls Club, or the Michael Jordan Fan Club run the exact same ad, it likely would not have been labeled commercial speech. But Because Jewel-Osco is a commercial enterprise whose sole purpose for existing is to make a profit, it was. (Although we probably won’t ever know for sure, since the Michael Jordan Fan Club probably doesn’t have the kind of assets that make lawsuits economical.) The bottom line: if you’re a for-profit business publicly disseminating a message, you should assume your message is commercial, even if you think of it as a public service announcement, or as primarily benefiting your audience. The second part of the question is why is it being communicated? If the CEO of Jewel had sent a personal note on official company letterhead to Jordan congratulating him on his accomplishment, you wouldn’t be reading about this. Not even if he sent a copy of the letter to the company’s PR firm to try and get some good press. Clearly the intent in that case would simply have been to say congratulations. But Jewel didn’t do that, because the primary purpose of the ad wasn’t to let Micheal Jordan know how much the company admired him, or how proud it was of him. Jewel took out a full page color ad in a highly circulated sports magazine and publicly linked its brand with his persona because it wanted to be associated with Chicago’s greatest living sports legend. Think about it this way: What would the Michael Jordan brand have been worth to Jewel if it had paid him for the right to use it? Answer: probably a lot. Linking his fame with their company in this way would be no different than if they ran an ad congratulating the athletes of the 2014 Olympic Winter Games. If they’d done so in a way that implied sponsorship with the games, without paying for the right to do so, as many sponsors do, they would have been liable to the Olympics for misappropriating its property. And they will likely end up being liable to #23 for similar reasons. In addition to helping further clarify the commercial/non-commerical dicotomy, this case also illustrates the importance for companies to know what type of message they’re disseminating at any given time. A clearer understanding of what standard a message will be subject to helps advertisers manage risk, and mitigate future legal entanglements. As for this particular legal battle, the court of appeals may have corrected an error of law, giving Jordan a clear path to another decisive victory. But in the court of public opinion, the Jordan brand may yet end up on the losing side. Thanks for the feedback, David, and I don’t disagree with you. Stopping short of passing judgement on the motivation for the suit itself, I think the district court erred on the commercial speech issue. I think Jordan did more damage to his reputation than any amount he may eventually recover. Thanks again. If the answer is “no” (as I imagine it almost always will be) they have their marching orders. Don’t run it. There you go making sense again, Glen. Thanks for reading! oh btw, adding insult to injury, did you know Jewel paid a premium to put their ad on the inside back cover? Perhaps they heard their hometown rival, Dominick’s (the other supermarket chain MJ’s suing), had purchased a premium position at the front of the book.